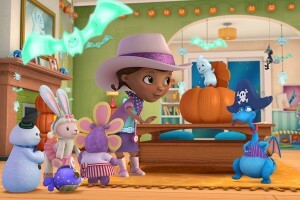 Beginning WEDNESDAY, SEPTEMBER 19, DisneyJunior.com is inviting families to visit DisneyJunior.com/Halloween where parents can upload videos of their child explaining and acting out what he or she wants to be for Halloween for a chance to be shown on air! The videos will be selected at random and will be shown every Friday on Disney Channel and Disney Junior throughout the month of October. The site will also feature Halloween-themed music videos, games and coloring pages based on favorite Disney Junior series. A new Halloween-themed episode of “Jake and the Never Land Pirates” premiering FRIDAY, OCTOBER 5 at 8:30 a.m., ET/PT, where Jake and crew invite Captain Hook to join them as they “Trick and Treasure” throughout Never Land and Izzy dresses up as the Pirate Princess to fool the Sea Witch, who has returned to Never Land to turn the real Pirate Princess into gold. Emmy Award-winning actress Carol Kane (“Taxi”), and “Beverly Hills 90210” alums Tiffani Thiessen (“White Collar”) and Tori Spelling (“Craft Wars”) guest star. I have not heard of this movie..sounds cute.